Each day, legal disputes arise between landlords and tenants. Make sure your new tenant has the opportunity to read through the lease agreement and other leasing documents before signing. This not only reduces confusion over lease terms, but increases compliance with the property rules because the tenants understand what is required of them. Provide a copy of the documents in advance, either paper or digital, and be prepared to answer any questions the tenant may have. Allow tenants a reasonable time to have the lease reviewed by an attorney if they wish. This shows the tenant is taking the responsibilities in the lease seriously. When it comes time to formalize the paperwork, meet with the tenant in person. Count all of the pages of the lease, and double-check that the most updated version of all needed attachments, like house rules, disclosures, non-smoking, pet or crime policies, are included. Create a checklist of all leasing documents, including any disclosures required by law. 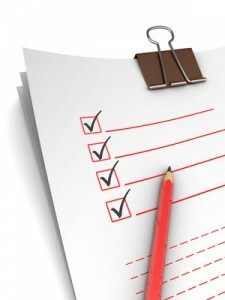 Attach that checklist to the front of every lease to show compliance. Timing may be a factor. Some disclosures must be provided prior to signing the lease. To find out what disclosures are required, landlords can seek the advice of an attorney, contact their local housing office or rental licensing department, or join their local landlord association. It is important to use these sources to keep pace with any updates in the law. Discuss walk-thru paperwork with tenants, and ask them to sign the initial move-in condition report. Provide space on the form for the tenant to note any items of damage. Offer a short grace period after move in for the tenant to note any other items. If the sheet comes back with additional notations, stop in to take a look at the damage right away. Pictures taken at the initial walk-thru can prove if the damage noted was caused by the tenant during move-in. Use a written form for modifications of the lease to ensure that the changes are in writing. When communicating with tenants, note the results of the conversations, in the event a tenant later claims the lease was modified verbally. Keep the lease specific to the tenant. For instance, avoid generic terms like “tenant” unless you have also listed the specific tenant’s name on the form. Blank lines left unfilled on the lease, sentences with multiple options not modified, or terms that are to be determined at a later time will work in the tenant’s favor, not the landlord’s. Note important dates from the lease on your calendar, including routine inspections, and the move-out date. Also, include a reminder date 60 days earlier, so you can contact the tenant about their intentions to move or renew at lease end. Follow up with a move-out inspection report at the end of the tenancy. If the tenant is present at this time, ask them to sign the move out report form, noting any damage that is in dispute. When possible, provide the tenant advance notice of what items will need to be repaired in order to receive a full refund on the security deposit. Disputes over security deposits are the most common reason a landlord winds up in court. Diffusing these disputes early can minimize the risk of income loss.